public relations coordinator for the Washington State History Museum in Tacoma. When: June 5 @ 10:30 a.m. Cost: $18 includes museum admission and program. Museum member price $10. 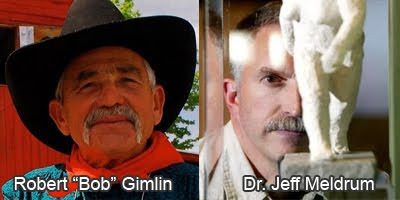 Background: Two giants of Sasquatch research will be at the museum hosting an audience discussion of all things Sasquatch. Dr. Jeffrey Meldrum and Robert Gimlin will be discussing their collected evidence, taking audience questions, and meeting with attendees. Dr. Jeffrey Meldrum, of Idaho State University and author of Sasquatch: Legend Meets Science, is frequently seen on the Discovery Channel, the History Channel, and the National Geographic Channel among others. His book is the companion volume to the highly successful Discovery Channel documentary of the same name. A professor of anatomy and anthropology, his work encompasses the evaluation of hominid footprints, including those attributed to Sasquatch, both in the lab and the field. The Giants in the Mountains: The Search for Sasquatch exhibit features casts Dr. Meldrum made in Eastern Washington. Robert Gimlin and the late Roger Patterson filmed the infamous piece of Sasquatch evidence known as the Patterson-Gimlin film, notably frame 352, made in northern California. This film features a female Bigfoot striding next to a sandy creek. Expedition partner Robert Gimlin will discuss his experience on the Bluff Creek expedition and the famous encounter on the trail, made immortal in the 24 feet of film Patterson recorded. The Washington State History Museum, flagship of the Washington State Historical Society, is located at 1911 Pacific Avenue in downtown Tacoma, just off 1-5. The museum presents exhibits, programs, and events that bring to life the stories of Washington's history. For more information, including hours and admission rates, please call 1-888-BE-THERE (1-888-238-4373), or visit our web site, WashingtonHistory.org. Use the map below to get directions! Ucu Added to "AKA Bigfoot World Map"
Bigfoot Communicating by Stick-art in Minnesota? Moehau Added to "AKA Bigfoot World Map"
Sasquatch Tops List as "Best Food Ever"